CHAR BUILDING: Main stage should have 3 layers in timeline: Field guide, Audio, and Char layer..
1. Go into the Char_All symbol and build first position as usual placing each part on a separate layer in order to animate easier later. Name parts of char from char P.O.V. It will remain constant even when the char is flipped. Once inside the char_all layer, there is no need to include the char name in the layer name column. Try to keep the description under 10 char. Otherwise it can’t bee seen in the window and becomes useless. • Create the rest of the head rotation inside of this symbol in order to make it”hot swappable.” You will break them out into separate symbols later. 3. Go back one level to the char_all and make 4 blank key frames in all the layers. -Now create the other body rotations in these blank key frames in order to make them hotswappble later on. Start with the head. Copy it to the other blank key frames and key it to the proper frame number. In this case 1-5. -Be careful to paste in place and do not move its position, rotation, or center point. -Only the char_head, and the char_all need to be hotswappable ;( sometimes the torso as well.) For line thickness issues, and ease of use I will create the rest of the body parts from the original positions. Use the Duplicate symbol command in order to create them and name them appropriately. 4. You should have a complete turn around now inside the char_all symbol. Make sure all parts are labeled correctly, instances are correct, center point, in their logical positions, etc… The head is still char_head_all in all positions at this point. 6. 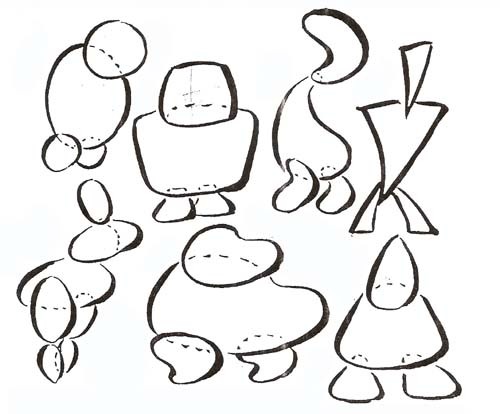 Then go inside each renamed symbol and delete the frames which don’t correspond to that position on the model sheet. All symbols should start on frame 1. 8. Congratulations, you have now created a character which every animator will love to work with. • Items which are hotswappable need to be named something which will fall next to each other in the Flash Library for ease of use while animating. • Name parts of char from char P.O.V. • Try to keep the description under 10 char on the layer name. • Rotation points in most logical positions. • Make sure every part is a symbol and they are on single frame in the properties box. • Movie is 720x486, 24 fps. Have your char built and rigged ready to start animation with next week.